The car got picked up today. It was old, and I mean, really old – from the last century – and had all sorts of problems and in the end it wouldn’t even start anymore. It didn’t make sense to keep spending money on repairs. So I suggested to donate it. Good idea. Only problem was that it took almost 2 weeks until it got picked up. We had pushed it out of the garage the other Sunday and down the driveway which is too narrow for a tow truck, so that the towing people could easily pick it up. It sat on the street in front of the house a week and then almost another week, and I saw it all that time sitting there and waiting for its destiny, feeling melancholic and bit impatient since I wanted it to get out of my sight and my mind. A car is a just a thing. But it’s still full of memories, stories, reminders of the past. I remembered the day when I picked it out from that huge dealer’s lot in Florida and we took it for a test drive, me pushing my husband to sign the contract. We urgently needed transportation in this sad part of the country. There was no other way of getting to work, shopping or anywhere else. Forget about riding a bicycle or taking public transportation, which was how we had gotten everywhere where we lived in Germany, Japan and California. I was being laughed at when I asked the real estate agent in Tampa to find us a house close to work so my husband could take his bicycle. You can’t go anywhere by bicycle!! So we got a car, the newest and fanciest one we had ever owned, a 3 year old Jetta. We are both not car people and not particularly status conscious, so this was a very proud moment for us! The purchase left enough money in the bank for some new furniture and other important items that we needed to start our lives at this new place. Several weeks later, driving to work and everywhere else, discovering the Florida beaches, small islands off the coast, the Everglades, both coasts, including Miami and St Augustine, it became clear that we depended on the car. But it also became clear that this car liked frequent visits to repair shops. It had issues that I had never even hear if before: a broken speedometer (my husband getting speeding tickets when the speedometer clearly read that he had been within the limits), alarms going off, dashboard lights flashing for no apparent reason, blisters starting to cover the finish, supposedly because of the Florida heat (did I mention this was a German car?). We kept hanging on to it, even moving with it to New York State (“Wrong direction!” My husband kept pointing out. “People move from New York to Florida, not vice versa!”). There, in the long cold winters, the Florida sand kept stubbornly hiding between seats and floor mats and no matter how many times I vacuumed, there was always a grain of sand somewhere. Still, we drove around in it, oblivious to the fact that as we grew older, so did the car. We found a new mechanic who promised to fix the electronic issue, then another one who supposedly knew better. The bills kept getting higher and higher. When I finally realized that my husband’s students drove newer and better cars than he did, I urged him to purchase a new vehicle. We downgraded the now “old” one to the transportation of tools and skis and Christmas trees and gave it occasionally to students from China who had just freshly obtained their NY drivers’ license. I suspect that the car took this as an insult and thus started to prefer spending even more time at the mechanic than in its own garage. Eventually it would refuse to move at all. So there we are. 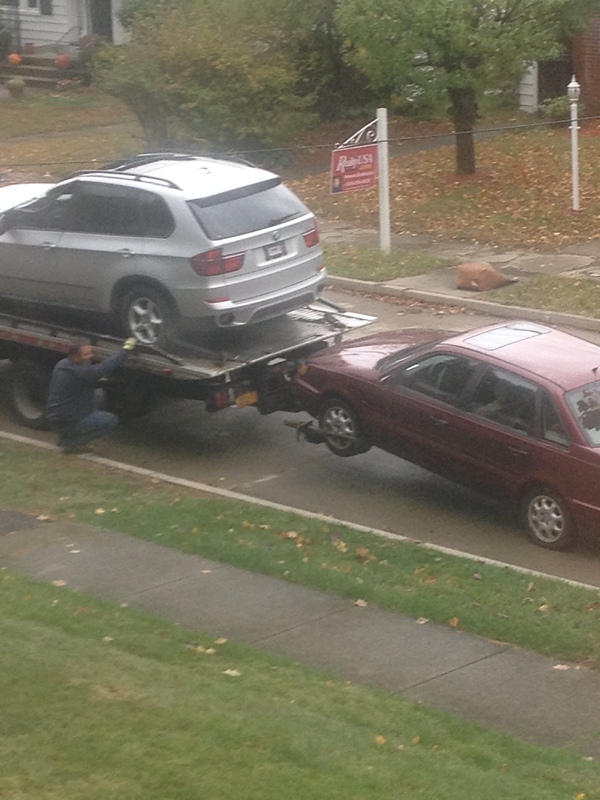 14 years and countless memories later, it just got towed and disappeared down the street.